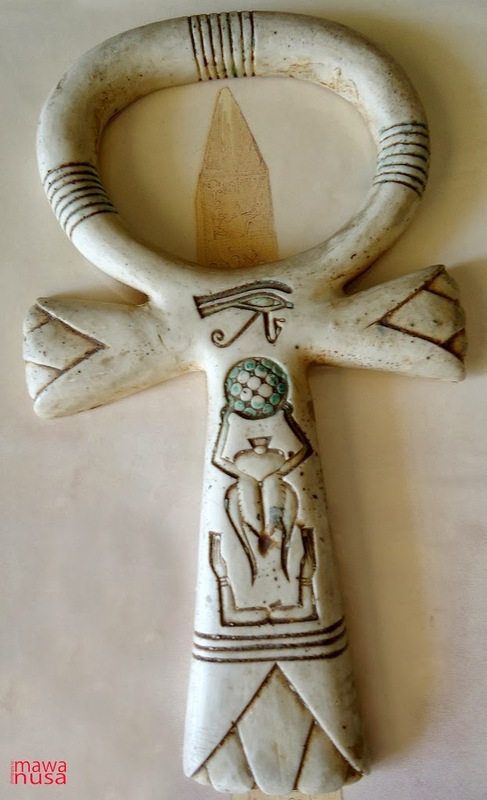 The most iconic and enigmatic symbol amongst thousands that are found in the ancient Egyptian scriptures is Ankh ( ), a key of life, recognized as crux ansata (cross with a handle). It is a hieroglyphic character of ancient Egyptian yantra or ancient sign of believer of eternal life, guidance, representing power, dominion, eternal life, the journey of life, and existence of life in this world and in the netherworld. During the earlier phase of the era, the Ankh symbol represents the unification between the Lower Egypt and the Upper Egypt. The vertical line represents the Nile River, while the horizontal line represents the Egypt Delta and the circular loop represents the string of unification of both regions, joined together into a great nation of ancient Egypt during that particular period of time. Since then the Ankh symbol evolved into a most powerful symbol, a kind of a master key to a multi-dimension locks that opens the access for this world and the universe. The Ankh, or the key of life, probably was the foremost religion symbol used widely as a symbol of God during the entire ancient Egyptian period. The creation of this symbol, the exact time that it was first introduced and who introduced it, still remained unknown until this time. This is such a brilliant invention, which also influenced the succeeding generations with varied dimensions of belief and culture. This means that this symbol was so powerfully created by ancient genius that expressed the past, present and future, in timeless existence, to prove that a supernatural being is there to guide the people, to love Him and to believe that God truly exist. To understand that the purpose of the creation of human being was not only to believe but also to put into practice in daily life, extended to social community life, to spread the love, to guide them to a better future in terms of belief and love of God. The relation between God and man was very close. This was apparent in every figure in every temple that there was no day without offerings, no day without remembering the Creator and no day without acknowledging His presence by chanting holy writings and prayers. Whosoever holds this symbol has the right to be protected and has the power to give life, and live forever in afterlife. It also means they have the right to protect others by any means. It is a symbol of God of the Universe, The Creator, The Universe, and The Unknowable Essence. The Ankh is a Tau cross or a ’T’, topped with a loop. It is a key-like symbol that signifies a powerful immortal, as it has given rise to its definition as a ‘Key of Life. It looks like a body of a man with long-rounded big head drawn beautifully with one very sharp corner at the bottom and arms that spread out that looks like a body, with eternal spirit. 1. The vertical bar: represents the body of the ankh, a symbol of masculine energy, and genuine will for a better world, representing command, a backbone of the believer in God. A command directed from top to down, the coordinate of the vertical direction of the universe. 2. The horizontal bar: represents the part of the body of the ankh, the journey, the feminine energy, the unity and the power balance. The symbol of the horizontal direction of the universe. 3. The curved top, the loop with a sharp corner at the start and end: the power of creativity, fertility, the horizon, manifestation of the universe, the circle of life as a reawakening, and the journey of the soul afterlife. 4. The combination of these elements formed a powerful symbol of continuity of life and belief itself; representing strength, health, it is the universal key of life that unlocks any gates, including the cycle of life and death. The creation of the Ankh was known to manifest the existence of the power of God and the power given to the Pharaohs to lead the ancient Egypt in the right path towards progress, unity, prosperity and as a respected nation. This means that there are opportunities to be explored and discovered in terms of inner power from the beings and the universal cosmic sources of Kings, Queens, Nobles and the peoples of ancient Egypt to be a part of a mystery of the development of their civilization. Ancient Egyptian believed that life is a cycle of attraction amongst elements that is giving life itself through birth and development of the fascinating knowledge to carry on the responsibility to raise the quality of life, the order that gives better perspective and hope for the next generation towards self enlightenment through the uses of the symbol of Ankh. Only Egyptian Gods, Goddesses and Pharaohs seem to carry this sacred symbol. And usually it appeared to be seen handled by the left hand while the right hand carries a dog headed stick. The left hand is said to be the hand of lesser spiritual power, where the position of the human heart is closely connected. The development of the symbol became more powerful as it evolved for blessing purposes, as a key to life and prosperity. Together with the ‘was’ sceptre (a sceptre with dog headed handle) and ‘djed’ pillar, it marked to be a very important part of the pharaoh’s daily life. 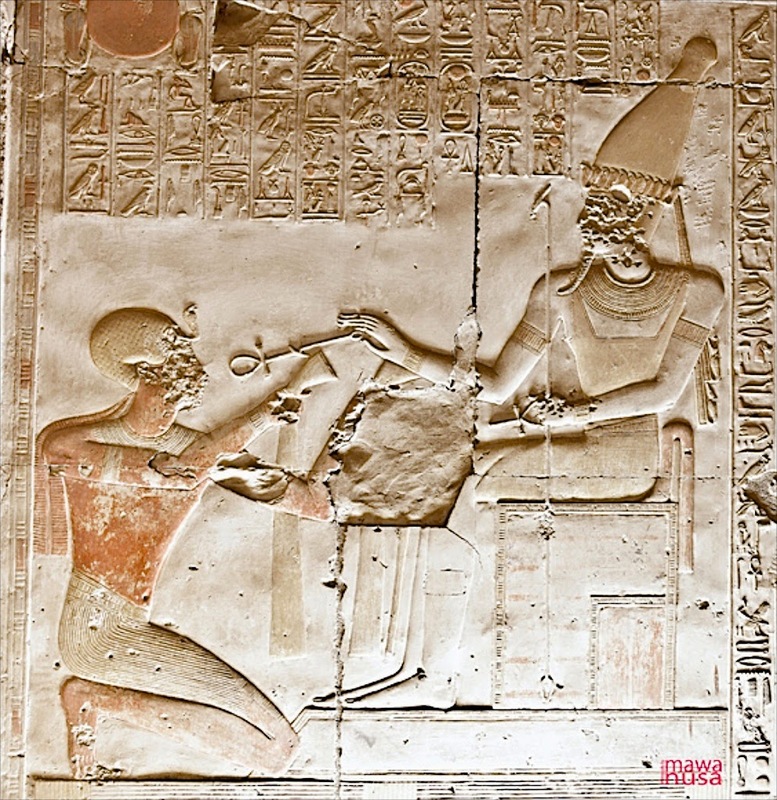 Some of the scenes on the temple walls appeared to show Gods or Goddesses blessing the pharaoh with His/Her key of life, just like what is seen on the wall of Abydos and Kom Ombo. 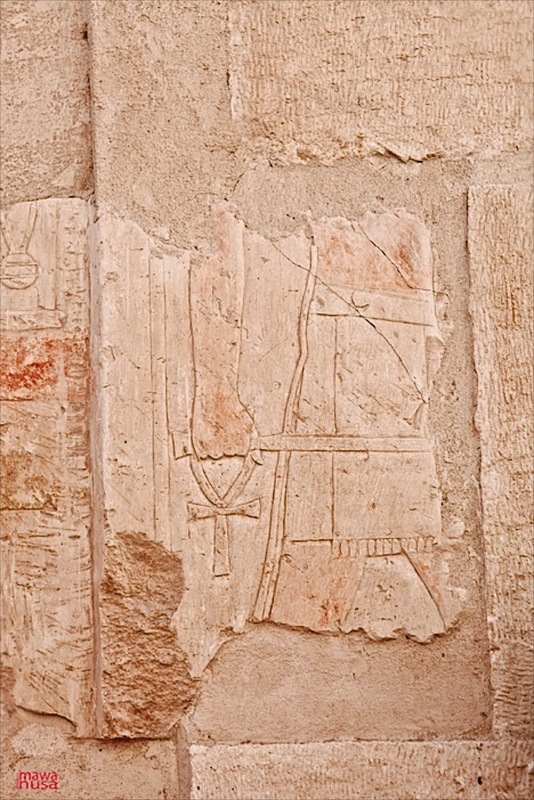 In some parts of the temple skirting, there also appeared the Ankh with hands holding the ‘was’ sceptre, dancing together and with the chariot as the life itself. 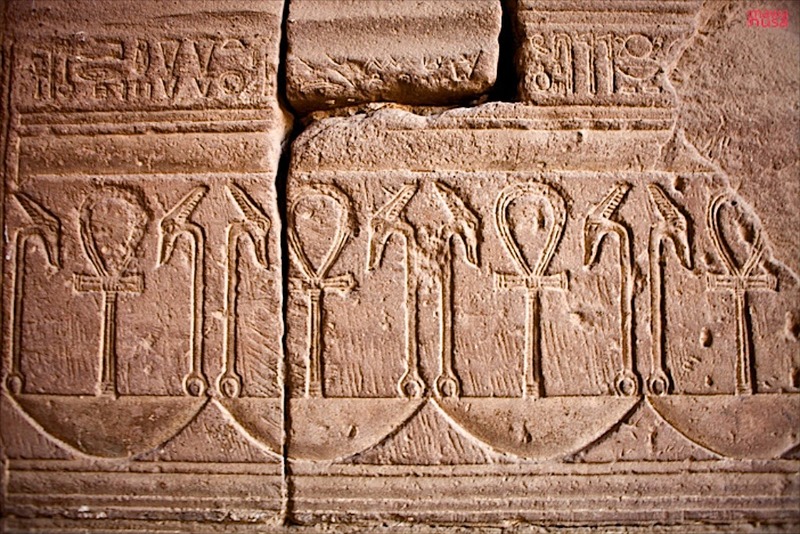 Or in the other part at Medinat Abu, the Ankh appeared like holding each other as to celebrate the life after death. 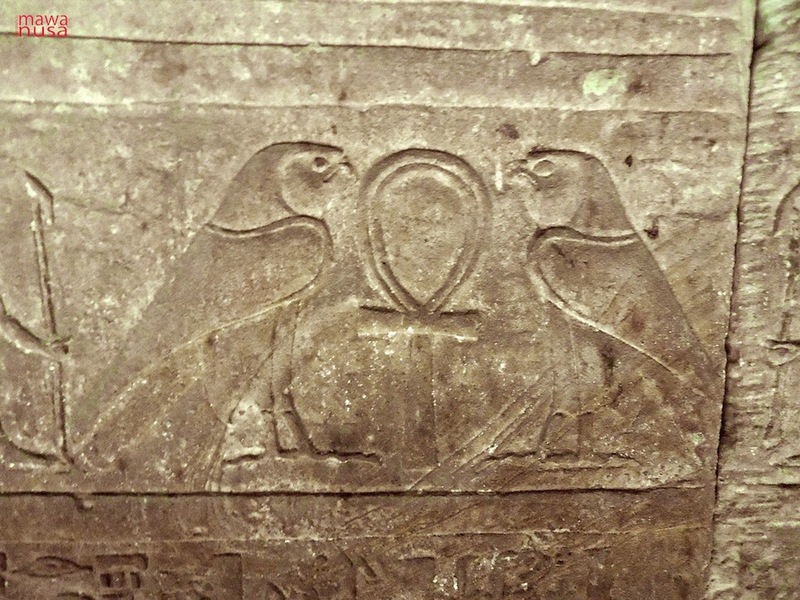 This symbol became widely used depicting the Gods or Goddesses blessing the King with ‘Ankh holy water’, symbolizing the love of life and a blessed life for the King forever. Some of the Ankhs are believed to have some spiritual power to bless the stones or to create holy water and this symbol became very sacred amongst those sceptres, flails, crooks or other royal emblems. Ankh is a ‘modra’ letter that you do not necessarily need to pronounce, but it is very meaningful and powerful, and it is true, believe it or not. That means that it has nothing to do with the lettering of the name of the ancient Gods or Goddesses. During the ancient time, to create an Ankh for a particular person, there is a need to choose a special day to start the work and the ornament needed will depend on the person’s character. The Ankh of Tut-Ankh-Amun is different than the Ankh of Ramses II. The authorized person, probably a priest, will create the Ankh and after finishing the work, the Ankh will have to give ‘life’ with the blessings from many holy priests in a special ceremony calling to life the Ankh. The Ankh will then be stored in a sacred place for several days to make sure the ‘soul’ of the Ankh is alive as characterized by the person who will own it. Some of the Ankh might have some scarification or special offering to specific Gods or Goddesses. During this procession, the Ankh will be stored in a special box. The king will carry this symbol wherever he travels or in daily life, morning, daytime and after sunset prayers. This will have to be kept in the same special case when the king sleeps. Special prayers were chanted whenever he open or close the Ankh case, this is very important so as to keep the sacredness and power of the Ankh. In a particular day there was also a ceremony for the Ankh, to clean the Ankh, bless the Ankh and to feed the Ankh with special offerings and prayers. 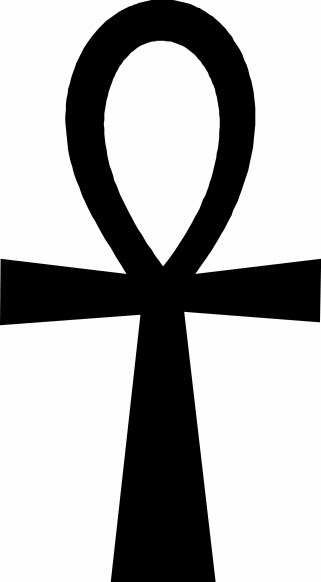 This will make the Ankh more powerful as it is getting older, as a representation of the owner of the Ankh. Some works of art were also introduced as the Ankh evolved. For example, the combination of the Ankh and the Djed, The Ankh with the ‘was’ sceptre, the Ankh with both of then. 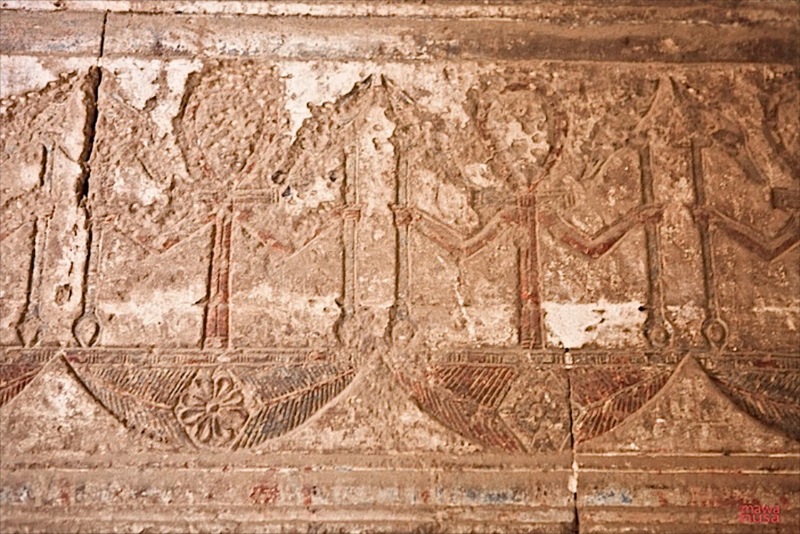 Even recently Ankh has been humanized as a dancing Ankh figures, with two hands holding sceptres, sitting side by side with the sceptres as a symbol of harmony as shown at the Osiris Temple at Abydos, or talking to the sceptres as shown at the Hathor temple at Dandera as well as an offering by the king as shown at the mummification temple at Medinat Abu. The Ankh of King Tut was also special and even King Tut stated his name to Tut-Ankh-Amun ( ) which meant that the Ankh here was something very special for the God Amun Ra, as representation of the faith of a strong believer of the King to God and through the Ankh he communicated directly to his God Amun. All of the original Ankh of pharaohs was believed to have a magical and spiritual power, with a specific command and also it was said that it was the secret of the pharaoh’s life, as an amulet, trace emotions, spiritual power, destiny and also to keep his command of the religion in the right track as well as to show that the carrier of Ankh has believed that the royal Gods and Goddess existed during that period. Just like a cross if you wear a cross it signifies that you believe in Christianity, or if you have ‘Om or Ong’ you believe in Hinduism, or if you have the ‘greatest name’ means you are a Baha’i, etc. The ancient Egyptian religion is based on polytheism that believed and worshiped many deities. All aspects of life were guided by religion. Peoples in the ancient Egypt civilization were lead by example of the pharaoh’s behaviors and their practice of their religion. Most of them also confess to be true as they created a God called Ma’at or God of Truth. They believed in more than 2000 deities. The highest God that they worshiped was Amun Ra, or God of Sun and Universe and the other one is Osiris, God of Underworld. Only during the reigned of Akhenaten, the ancient Egyptian believed in only one royal God, called Atum or God of Creation. To interact with those deities one may need many ceremonies, a variety of offerings, and the presence of an Ankh is a must and most significant, and including more other things. 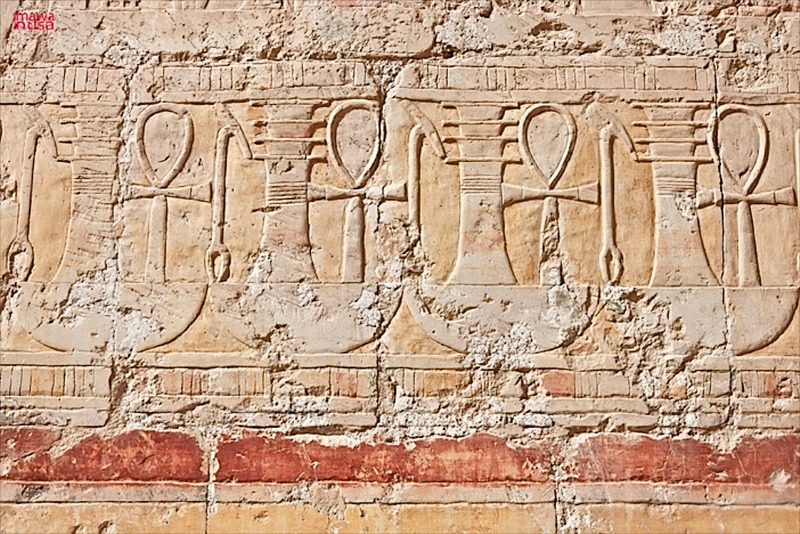 In many figures found in the temple walls, when the kings met their Gods or Goddesses there would appear in most of them carrying an Ankh by their left hands while the right hands carried a sceptre. Here the Ankh showed a signal that they were on the same path, communicating the same language and living at the same time. Briefly, Ankh symbolized many things in the kingdom. Some celebrations or ceremonies will never be complete without the presence of the Ankh as having a constant use of this symbol believed to descend spiritual messages to the entire country. The more powerful and respectful the king, the better and more powerful the Ankh will be. The king will be able to continuously add this spiritual power to Ankh with many interactions with the nature’s spiritual journeys, meditations, prayers and unseen spiritual influence or power from within the king himself. So the Ankh was probably been used also to bless heavy stones in the quarries so that the stones can be easily lifted up and carried to the temple sites. The Ankh will be kept in the holy water and with special verses and spells, the holy water will gain power and these are then sprinkled to the rocks and stones that need to be transported to the temples. The balance between macro cosmos and micro cosmos was also very important in this time and the Ankh was keeping this balance, as an amulet of the pharaohs. The Ankh was known to be the main channel for the king’s balance of his own-self and the outside world. When you travel to most of the temples in Egypt you will still be able to trace the spiritual power of this Ankh. You can somehow feel it if you are sensitive to this kind of unseen power. Until today the search for the mystery that existed since thousands of years continues, The traces of the ancient Egypt is still being recovered each passing day and we hope that the Egyptologist and archeologists of our time will be able to explain where, when, why and how this mysterious symbol was exactly invented. I always love to read the articles that are on magic, spirits, angels & demons. Now in the modern era, there are still thousands of people that are live in with superstition. One of the most common prejudice is- evil eye hand- a common superstition among many peoples of the harmful effects of view of some people ("evil eye"), or under certain circumstances. Amulet against the evil eye is usually depicted in the form of concentric circles. Most often symbolizes the pupil black circle in the center of the yellow or blue spots present in this souvenir. Whether you have the same superstition or not, I suggest you to use evil eye hand to get rid of this such superstition. It has the magical power to keep you free from any kind of misshapen in your life. Get the ornament at http://www.sealofsolomon.net/hamsa-symbol/.